Here in SW Florida, especially Cape Coral, Ft Myers, Naples , woodgraining garage doors is a popular option for many homeowners. 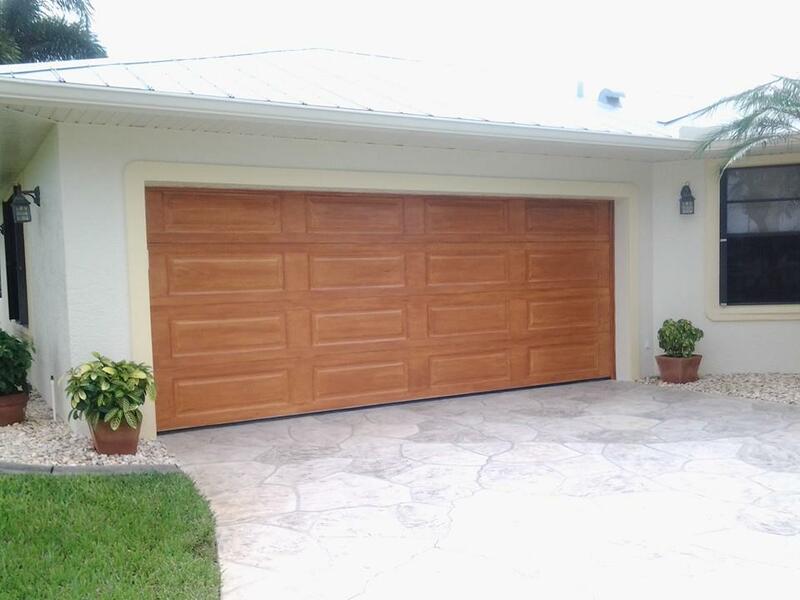 Woodgraining garage doors in Fort Myers, Naples, Cape Coral plays really nice into the stucco architecture so common in our area. There are many companies that use gel stains to achieve a convincing wood grain, but its not the best route to achieve this look. Gel stains are not only fragile in UV light, but also the use of an oil based product on a garage door can void the warranty. The better approach is an acrylic based system. The pigments are more UV resistant, and the paint film itself is stronger than a layer of gel stain. The end result not only looks great, but lasts longer than an oil based stain finish. Especially in areas like Cape Coral, Ft Myers Naples, the extra strong UV from our strong sunlight needs to be taken into account.